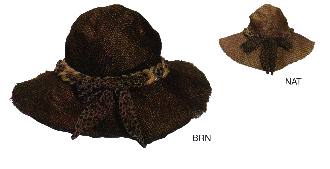 Grace Hats Sophia Hat available in Natural or Brown. This is a funky and completely deconstructed raw edged wid brimmed floppy hat. Details include a fun vintage plastic chain loop band and leopard scarf tie.